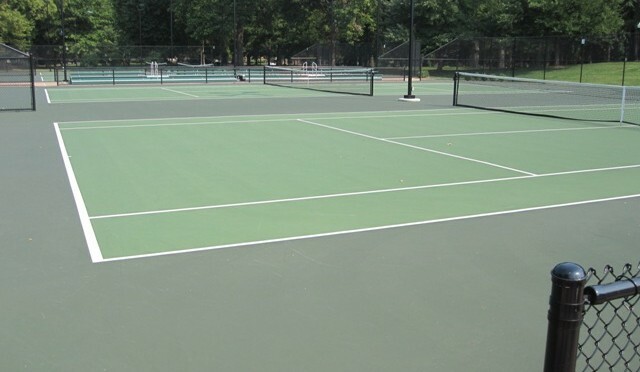 We are your source for tennis court resurfacing in Kentucky. SportMaster representatives can provide a customized tennis court repair and resurfacing specification and provide you with qualified tennis court contractors. Free estimates from affordable contractors are available in northern, western, eastern, central, and southern Kentucky. Navigate through the site menu to find you specific city area, or fill out the contact form for faster assitance. There are 16 standard tennis court colors to choose from with SportMaster. Popular colors in Kentucky are Gray & Red (University of Louisville), Blue & Light Green, & many other regional color combinations. With 16 standard colors, there are plenty to match your favorite school or sport team colors. Our local tennis court contractors can also apply custom logos and blended lines for other sports on your tennis court. The SportMaster ProCushion system is a premium option that provides multiple layers of acrylic bound rubber beneath the tennis court colored surfaces. This gives you a cushioned tennis court for absorbing shock and alleviating excess stress on the joints and muscles. The player comfort achieved with a cushioned tennis court surface will allow tennis players to extend their practice and playing time, and raise the level of their game. Once a SportMaster ProCushion system is applied, the tennis court will only require resurfacing of the surface coatings every 4 to 8 years. The cushion layers will continue to provide soft play for many years, paying back the initial investment of the additional rubberized surfacing layers. SportMaster is the official surface of the USPTA (United States Professional Tennis Association), and the SportMaster ProCushion system is installed at the USPTA headquarters. There are two cushion products that make up the ProCushion layers: CushionMaster II (coarse rubber granules) & CushionMaster I (fine rubber granules). Both of these layers are engineered with post-consumer, reground rubber. This is a sustainable and recycled material, and also may contribute to credits with the LEED program and other “green” projects.